It was not unusual to experience damage at Pinetree Line radar stations due to high winds. What is unusual is the apparent lack of a compiled document that provides details indicating "what happened, where, and when". This file contains a summary of "significant" Pinetree Line radar station "wind damage" that is known, and documented, to have occurred in Tofino, BC. Still stormy. Tarpaulin temporary roof on #1 tower blew off again. Third time. The CPS-5D search radar antenna was blown off of the tower in late evening. 70 to 90 miles per hour winds were recorded. Parts required for repairs were obtained from the USAF. 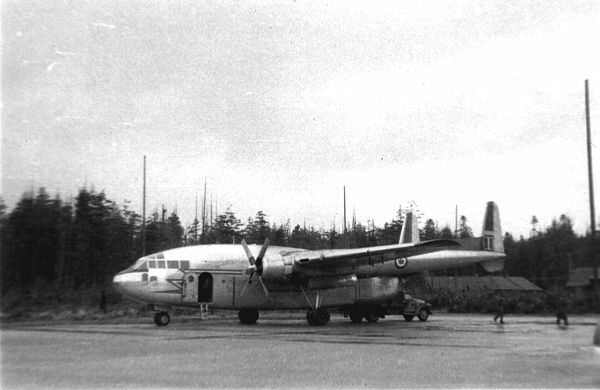 The search radar eventually became serviceable on 2 Apr 56. 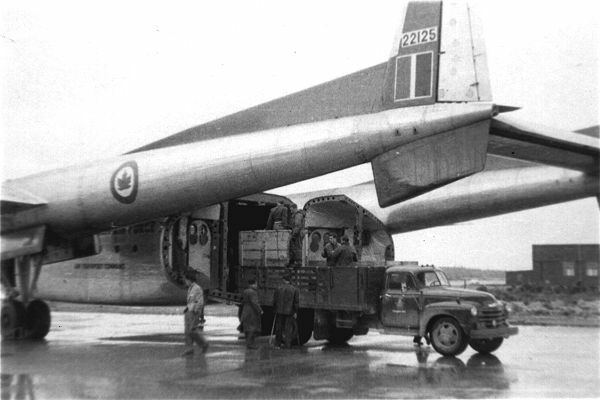 RCAF C-119 bringing in CPS-5D search radar antenna parts - 29 March 1956 - Courtesy Boots Bambrick. There is no doubt in my mind that there have been other examples of "significant" Pinetree Line "wind damage" which has taken place. As an example, I keep hearing about the Saglek situation – where their height finder was an apparent victim. This unit was located at the edge of a 1,800 foot cliff – so you can imagine the damage to any radar equipment that "went over the side". I continue to hope that some day, some one will provide some "official detail" – and then we will be able to add this occurrence to our list. If you have any knowledge of other "significant" Pinetree Line "wind damage", please help us out and pass the detail to us – via an email message. Many thanks.